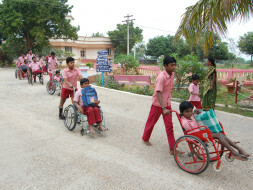 Siva Saraswathi Vidyalaya, an inclusive school, was started as a primary school in Ayikudy village in Tirunelveli District of Tamilnadu in June 1981 with 5 students in a thatched shed as the first effort of Sangam to give quality education at an affordable cost to the physically challenged as well as other rural poor students. The school grew to 5 teachers and 110 students by 1990, to further the progress in our integration efforts of disabled children with others to achieve equal rights for all. In 1995, we started Middle school which was upgraded to High school in 2009 and to Higher Secondary in 2015. As a matter of engaging Amar Seva Sangam with the overall inclusiveness in the society, we are for the fifth consecutive time participating in the Chennai Marathon organized by WIPRO and United Way, Chennai. This is the program where we call for solidarity for the differently able among the general public and give the opportunities for them to play a positive role in the society and the national development. We need not emphasize the fact that this will greatly improve the human resources of our country and provide better job opportunities and sporting activities among the differently able. In this connection, we seek you to look into our participating webpage in the United Way portal and join us in our initiative for the better life of the differently able. Your participation can be in the form of donations for which you will be eligible for income tax benefits. There are other ways to participate as well by joining us on 3rd December 2017 on the sidelines of Marina Beach to Tidel Park to be our cheerleaders. Amar Seva Sangam have a such program is the extension of our Siva Saraswathi Vidyalaya Higher Secondary School building. This initiative is a must to provide adequate classrooms, labs and other amenities (disabled friendly), so that our school children are imparted with good quality education in comfortable ambience. We are undertaking the extension work in phases and we have so far successfully completed phase one and two. Phases three and four of the construction work, with which the total building will be complete, are yet to be done. We need funds to carry out the remaining work so that the desired objective of rendering education to these poor and physically challenged children could be achieved.